Is there anyone else planning to buy this game? Here are 2 laps at Spa done by me, after just 15 minutes of trying the game. My friend's buying the game once he has his elite (got rid of his old 360) and is lotus a starter F1 team or is it your choice? Even so it looks AWESOME! You can choose between Lotus, HRT and Virgin in the beginning of your career, and I chose Lotus. That's why I raced this Time-Trial run in the Lotus. Just trying to get the feel of the car. ...and is lotus a starter F1 team or is it your choice? You can also choose Hispania or Virgin, if you for some odd reason would want to. ...oops, Ricardo already answered the question. Here's another: Can this game be successfully played with keyboard? I could give it a try, although I'd rather use my G25. -edit- I just tried with keyboard and I could get round Spa pretty easy. I did have all assists on except for braking assist, I want to brake when I want to. I won't recommend cockpit view for keyboard, because when you tap the steering, the ingame wheel goes a complete 90 degrees (or whatever the amount may be) every time you tap. And that's a whole lot of distraction. Otherwise I think with some practice one should do fine. Too bad there isn't a demo to try out at first. ...other assists yes, but brake assist no. This is how I've got the settings for now. I know I'm kinda a loser playing with the Dynamic Racing Line, but it helps me to get to know the tracks and the braking points. Same goes for the traction control. 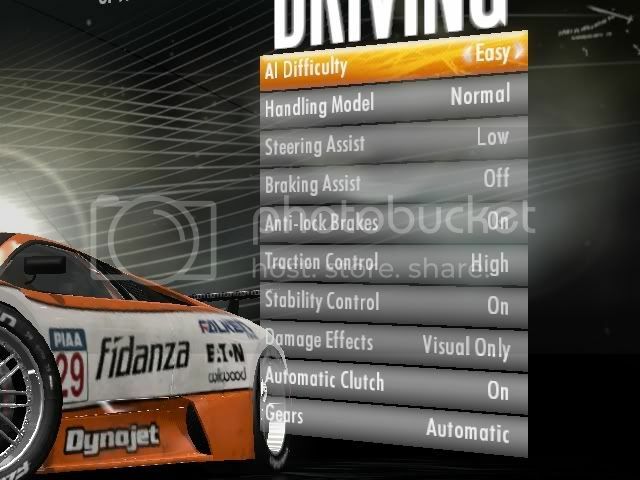 I just want to know the game first, and later on I'll remove those features, just like I did in Race07 and addons. Eventhough it doesn't feel like GRID, I think that if you have played that game and could control the cars, you could play this game too. The handling doesn't feel that difficult. I did manage to get my first Pole positions and my first Race win. Okay, how realistic is this game? Like how does it size up against a classic like Grand Prix 4? How bad does rain f**k you up, and how do pitstops go and how often do you get mechanical failures and stuff like that? 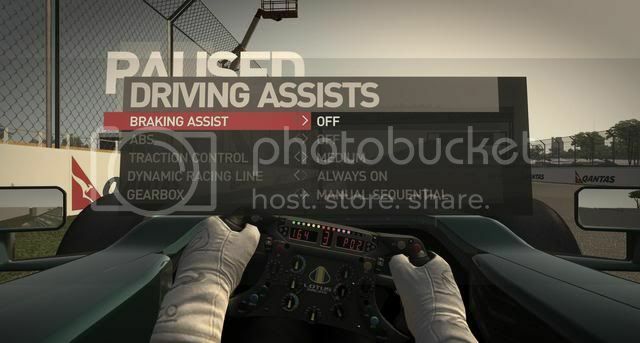 It's been a long time since there was a good F1 sim for PC. I have this game and its excellent i have every assist off so no abs or traction or anything its pretty hard, i started with lotus but then went to virgin that car is better for me after a bit of tinkering it runs great now. Now you and Ricardo can start some PBRC's (and invite some other F1 racers over). On the other hand I think it's really disgusting - if you really think about it - that the best sim to date dedicated to F1, dates back to 2002. I personally wasn't exactly waiting for GRID with F1 sauce. Sad really that a game like GP4 nowadays will probably never see the light of day, ever. But again, game looks good and I will try... sometime-ish. 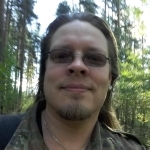 (and the review answered all my questions, so thanks for that Jussi). I have the printed (Finnish) version of that magazine. That's how I guessed the review would answer a lot of questions.